ARE YOU READY TO TAKE CONTROL OF YOUR CAREER & DO WHAT YOU ACTUALLY LOVE? READY TO IDENTIFY THE CAREER THAT IS RIGHT FOR YOU? Are you ready to find a Job or a Career that fulfills not only your financial needs but also your emotional needs? Are you ready to start working at a job you actually enjoy? Do you think you deserve to have a job you love and get paid well for? Are you ready to find the career that aligns with your values and your life purpose? THIS CAREER PACKAGE IS FOR YOU! This Career package is meant to help you identify the career that aligns with your values... Because trust me, that career is out there. 1 and half Hour Workshop Style Masterclass. 3 In-depth lessons on finding the Career that is meant for you. A Full workbook to take action while taking the class. A walkthrough and explanation of all 53 questions in the workbook. 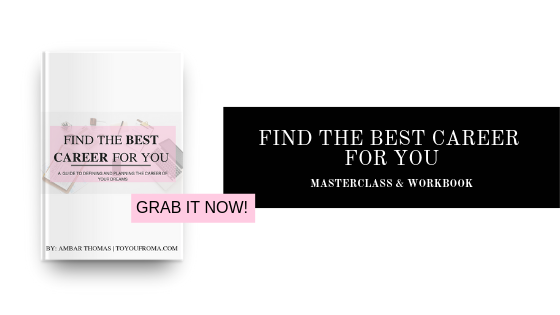 Once you make your purchase, there will be an email with the link if the Masterclass and your copy of the Workbook waiting for you in your mailbox. Have you been contemplating about making a job change or a career change, but don't know where to start? Currently feeling like you are ready for a change, but scared to make it? Do you feel unmotivated to show up to your current job every day? Do you feel like you're wasting your time when it comes to your Career? Are you currently unhappy/unsatisfied with where you are in your career at the moment? Is your current career filling only your financial needs but not your emotional needs? Are you tired of taking all those "one-size" fits all quizzes to be able to find the career for you? If you answered yes to any of these questions, this is the Masterclass & Workbook for YOU. Help you understand where you are in your career and where you want to be. It will help you identify actionable steps towards making your vision a reality. 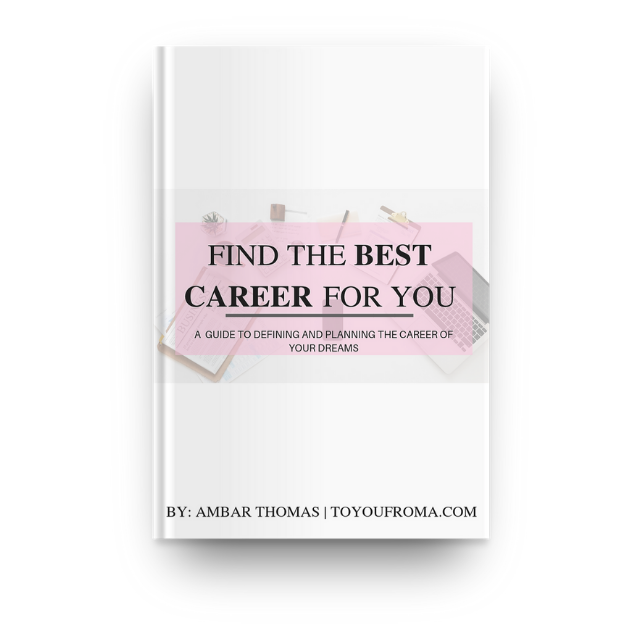 This workbook has been created with the main and only goal to help you dig deep and identify the career and job that is meant for you. Career exercises that will make the Job search process a piece of cake. 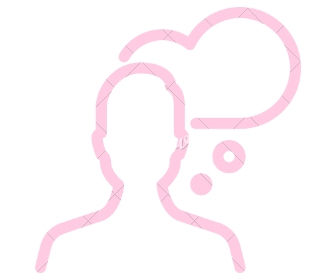 Help you identify your career WHY. Help you identify the difference between your career WANTS vs NEEDS. Give you a clear perspective of where you need to be. A step-by-step guide to help you get from point A to the career you want. 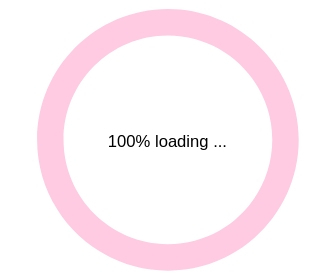 This is not a "one fits all quiz". In fact, it's not a quiz, it's a guide. Finding the root of the problem is the main step. Knowing where the problem lies in your current career will help you avoid making the same mistakes. Once you know where the problem lies, you will know how to avoid it. This phase will ask the right questions to dig deep on the problem(s). To be able to have a career that you love, first, you need to know what you need from it, in order to do that you need to dig and be honest with yourself. 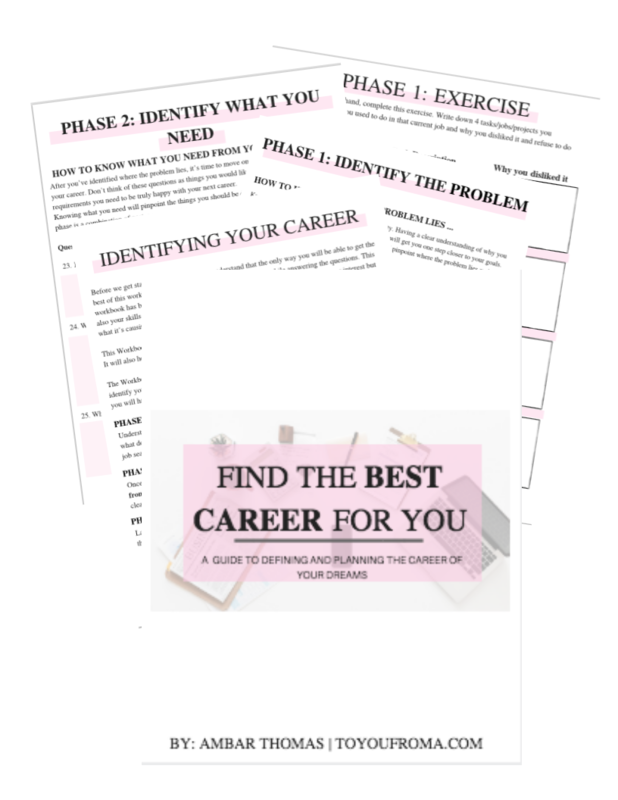 This phase will ask you the questions that will help you identify a career that will actually make you happy and that aligns with who you truly are. Having a clear understanding of what you want is a must. You should know the difference between the two (the need vs the want), to be able to know what you are able to live with, as well as live without when it comes to your career. Your wants come into play during the job search process as well as the negotiation process. Think of your wants as the key points you need to be able to have the career of your dreams be a reality. 22 Questions designed to identify all of your career problems. 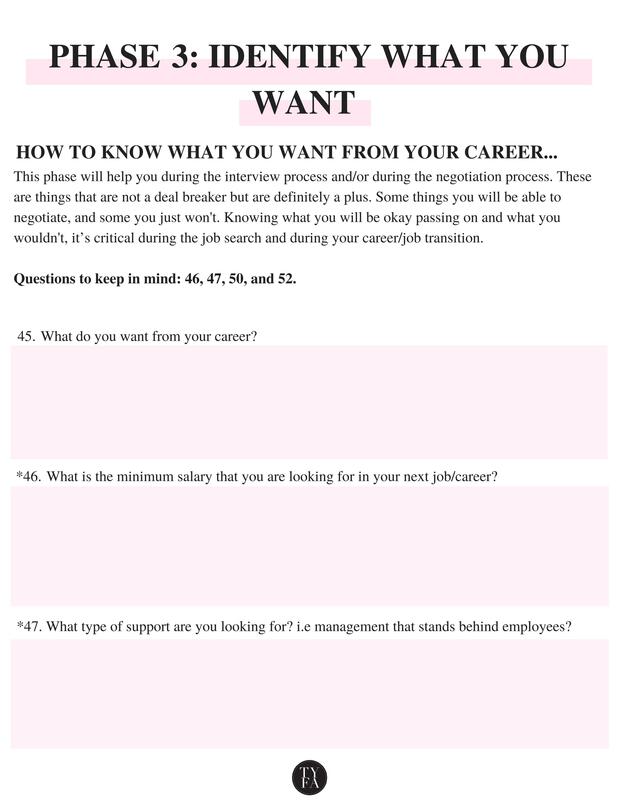 20 Questions designed to identify all of your career needs. 8 Questions designed to identify all of your career wants. You can buy the career package for a total of $50 USD. The package includes the full fillable workbook, 1 and a half master class and career planning section. All yours to print, save and download for the end of times. You can rent the career package for only $20 USD. You will receive everything that is offered when you buy, BUT it will be only available to you for 72 hours. 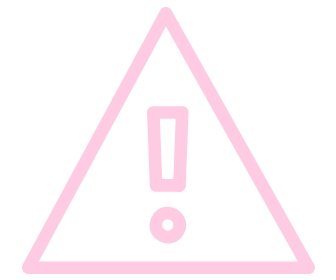 You will not be able to download, save or print the information. 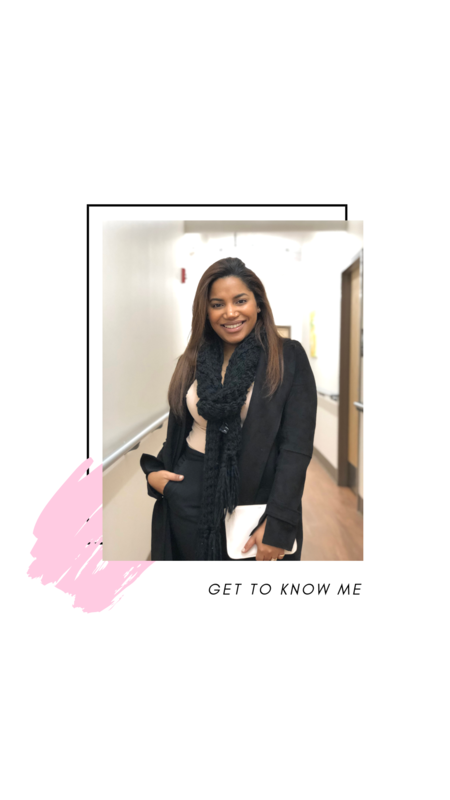 I'm Ams, the creator of TOYOUFROMA.COM a platform created for the millennial woman. Over at To You, From A I help women achieve their highest potential in the professional world. It is my mission to guide you through your career journey while also helping you become the best version of yourself. Enough with taking a job just to get by and pay your bills. Enough with feeling miserable and unfilled with the work you do. It's time you start putting your goals first and making them happen! Over at To You, From A, Ams focuses on helping women achieve their highest potential in the professional world. It is her mission to guide the everyday girl through her career journey while also helping her to become the best version of yourself. You are now one step closer to finding the career that is best for you! Go check your email, your Masterclass & Workbook is waiting for you.